This blog is an introduction to use ‘plm’ package for panel data analysis. Panel data means datasets with the same observations (respondents) and variables across different time units (such as year, month). And it’s common for researchers to have an unbalanced panel dataset in practice (for example, GDP data could be missing in different years for different countries if you check on the World Bank website). 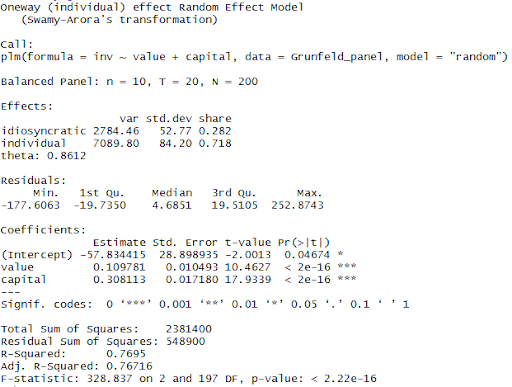 This blog will not focus on statistical theories, so please read ‘’Panel Data Econometrics in R: The plm Package” written by Croissant and Millo for more theoretical details. There are several built-in datasets in ‘plm’ package which you could use after installing and loading the package. In order to define panel data in R, you need both observation ID and time ID, then use the function pdata.frame(). This entry was posted in Statistics & Data and tagged R on November 2, 2018 by Wei Yin. 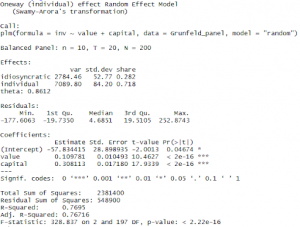 In the previous 3 blogs, I have introduced how to define survey data and do descriptive statistics (here are the links for R ‘survey’ package blog (1) (2) (3)). Today, I am going to introduce basic regression syntax in this package. Let’s use the two-stage cluster sample (we have introduced in blog (2)) “apiclus2” as an example. Let’s assume api00 is the dependent variable, ell, meals and mobility are independent variables, survey data is defined using svydesign() function, named as “dclus2”. The syntax of this generalized linear model is written as following. # The default family is linear regression, if you aim for non-linear regression, for example binomial logistic regression, the syntax could be modified as following. stype is the dependent variable in this model. The full version of manual about package ‘survey’ is here. Please check more functions and detailed descriptions, arguments and examples in this link. If you would like to discuss any further questions based on this blog, feel free to email data@library.columbia.edu. This entry was posted in Statistics & Data and tagged R on October 26, 2018 by Wei Yin. 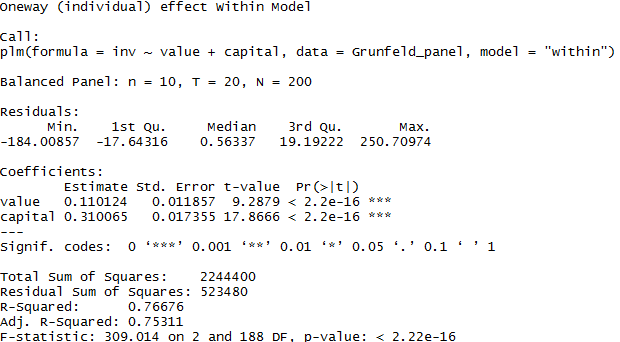 After defining your survey dataset (please refer back to ‘survey’ package blog (1) & (2) ), you could use the functions below to describe your survey data and estimate population. Let’s still use apiclus1 data. After svydesign() function, you have a designed survey dataset, dclus1, which we designed in the last week. In this dataset, there are several variables we are going to mention in the following syntax. svychisq(~sch.wide+stype, dclus1) #contingency tables and chisquared tests between sch.wide and stype. The default (statistic=”F”) is the Rao-Scott second-order correction. And there are other options for “statistics”, such as “Wald”, “Lincom”. This entry was posted in Statistics & Data and tagged R on October 19, 2018 by Wei Yin. Here are more types of survey data except the case (simple random sample) we introduced before. The ‘survey’ package contains several sample datasets from the California Academic Performance Index. After installing and loading the ‘survey’ package, you could import these data samples using command: data(api). And you will see 5 datasets are loaded in R, including apipop, apisrs, apistrat, apiclus1, apiclus2. For these datasets, the variable to identify survey strata is called “stype”, the variable for sampling weights is called “pw”, and the “fpc” variable contains the population size for the stratum. These terms are all related to survey design methodology. Usually you could find details in data documentation. The apistrat data is a stratified independent sample. If we define survey data called “dstrat”, the survey design syntax is like following. The apiclus1 data is a cluster random sample (without strata). If we define survey data called “dclus1”, the survey design syntax is like following. The apiclus2 data is a two-stage cluster sample. If we define survey data called “dclus2”, the survey design syntax is like following. The examples given above are for your reference. In reality, your svydesign() syntax is customized based on your data sample. svydesign() is the first and important step in R for survey data analysis. Before doing this step, you must understand your survey data design methodology well. If you have any further questions, feel free to reach out to the Research Data Services (data@library.columbia.edu). In the next two weeks, I will introduce how to use ‘survey’ package for descriptive statistics and regressions. This entry was posted in Statistics & Data and tagged R on October 12, 2018 by Wei Yin. If you are using R for survey data analysis, you might find the ‘survey’ package is useful for you. I assume that you have already known how to read/import data in R, so this blog will skip the steps of data cleaning and loading. 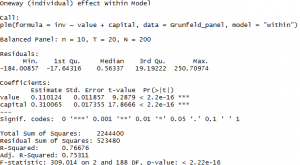 After importing survey data in R, here are some functions you must know for survey data analysis. All the functions introduced in this blog are with prefix “svy”. The first step is to define your survey data. The command is svydesign(). This week’s blog will introduce how to design simple random sampling (SRS) data, and in the next week, I will post more information about how to design stratified and clustered survey data. Simple Random Sampling: The sample subjects are selected by an equal random chance. You could assign a new name to your survey data, so that you could use it in the following data analysis steps. For example, you received 305 surveys randomly from all the 6291 residents in a neighborhood about their basic demographic and socio-economic characteristics (such as age, gender, race, household income) and attitudes of online shopping. You have a survey dataset named ‘shopping’, with n=305 and N=6291, and you are going to define this dataset as survey data called “shoppingsvy”. This entry was posted in Statistics & Data and tagged R on October 5, 2018 by Wei Yin.